Sales rank history is a very important info seller to measure past sold history, in order to determine the possible future time frame to sell this item at a reasonable price. There are two ways to see sales rank history. Via Scoutly app (without Keepa subscription). After you do a live search on an item, then tap CamelCamelCamel (CCC) button, Scoutly app will show you monthly sales rank data. Via paid Keepa subscription. If you subscribe to Keepa data subscription ($17 a month), you can log in to Keepa site with your account to see the sales rank data. Scoutly will remember your Keepa account, so you only need to log in once. Scoutly app will show you a Keepa snapshot. If you are lucky, it may show you the sales rank (2). 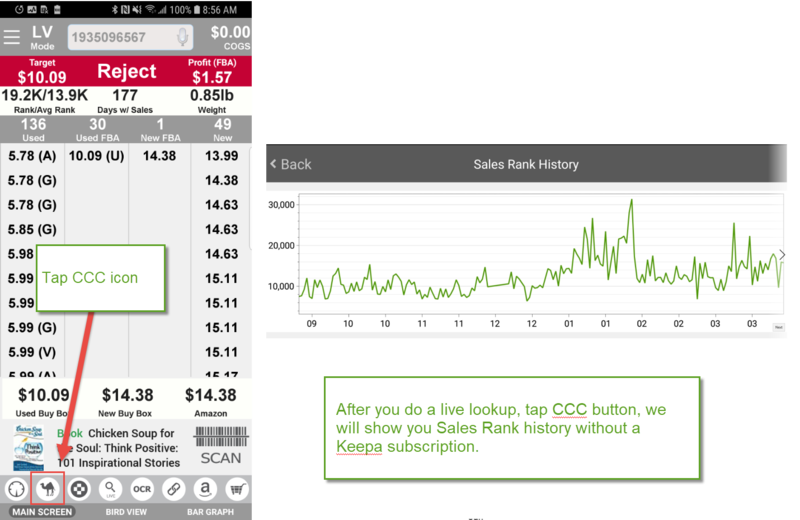 Try tap different options to see if sales rank data will show up or not. If no sales rank data show up, tap Keepa (3), it will navigate you to the Keepa website. Log in with your paid Keepa account (4). The phone should remember your account info, so you only need to log in once. After you log in, the Keepa site will show the sales rank data (5).